Dalkeith & Monktonhall Brass Band are a local Brass band training in Prestonpans. They are a long established band performing at high levels in national and local competitions – gaining a third-place result at the National Brass Band Championships of Great Britain in 2017 while finish 4th at the weekend in the Fife Charities Contest in Kirkcaldy. 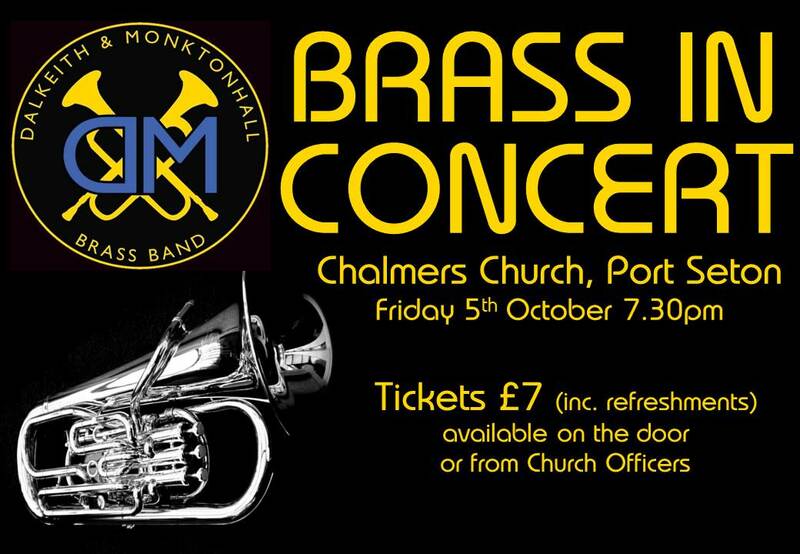 The Band have a rare opportunity to be heard locally in Chalmers Church, Port Seton on Friday evening – 5th October at 7.30pm. Entrance is £5 – but we would extend a welcome to all interested brass band pupils in your School – with a discounted entry of £5. The Band also have a training band for all ages so any pupils and parents, guardians or grandparents interested in learning brass – from any level of experience – can find out more about this group which meets in Prestonpans on a Wednesday evening at 6.15pm. Many members of this training band have been promoted to the main band taking up very competitive seats in a top level band.